Carica papaya is a plant, so it gets its food like most other plants, through photosynthesis. This means that the plant makes its own food using the sun and water. When an organism can make its own food, it is called autotrophic or self feeding. Photosynthesis occurs in specialized cells called chloroplasts which are usually located in the leaves of the plant. 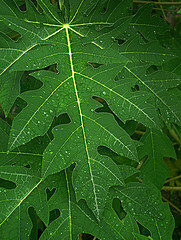 This is the perfect site for C. papaya because its leaves are very broad and large providing a greater surface area for photosynthesis to take place. The leaves also have a pigment in them called chlorophyll which helps to absorb the sunlight and it is what gives the leaves their green color. One of the final products of photosynthesis is a sugar called glucose. This is what the plant uses and stores for energy. Photosynthesis is great and all, but how do the leaves at the top of the plant get water from the roots all the way down in the ground? Well, C. papaya falls into a category of plants called vascular plants. 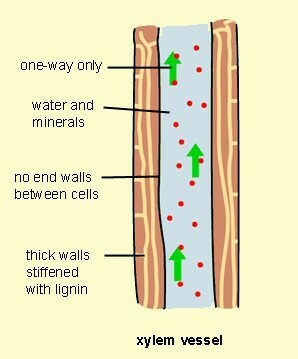 This means it has specialized tissues that help transport water and nutrients up and down the plant. These specialized structures are called xylem and phloem. 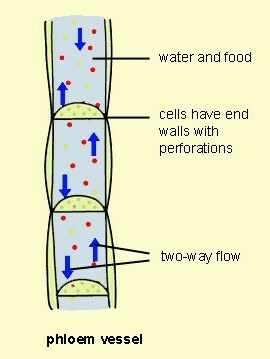 Xylem helps move water up from the roots to the leaves to be used in photosynthesis. Now that you know how C. papaya gets its nutrition, find out how it is good for other organisms on the interactions page.